Brojects (2014) on Netflix India. Check worldwide Netflix availability! If Brojects isn't available in your country, or you are visiting a country where it isn't, there is still a way to watch it! 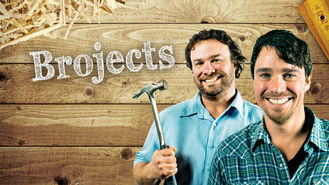 The Buckles Brothers tackle creative, inspired and sometimes daffy DIY projects for their summer dream cottage in this home-improvement show. It's a 7,000-square-foot former lodge hall. If these brothers ever finish renovations, it will be their dream cottage.